This whole home collection instantly creates a welcoming and cozy appeal to any and every room of your home. The Weatherford Collection by Kincaid proves that a sophisticated home doesn't need to feel cold. Warm things up with this naturally weathered look with charming aesthetics and beautiful details. Constructed of solid New Zealand pine wood, the Weatherford Collection by Kincaid emulates a look of heirloom furniture with modern, high quality construction. The collection features two different finishes, a darker Heather finish or the lighter Cornsilk White finish. Choose from the all-over Heather finish, or the Cornsilk White finish with contrasting Heather finish tops on a variety of bedroom pieces. Instantly create a calm and comfortable setting for the most important room in your home - after all, you need your beauty sleep in a beautiful room. Weatherford's three bed options provide options to create the perfect room to suit you. The shutter style headboard coordinates nicely with dressers and case pieces also featuring shutter style doors. Dress up your room a bit more with the panel bed featuring intricate detailing and turned posts. The metal bed helps to break up the wood storage pieces in your room and create a beautiful focal point. 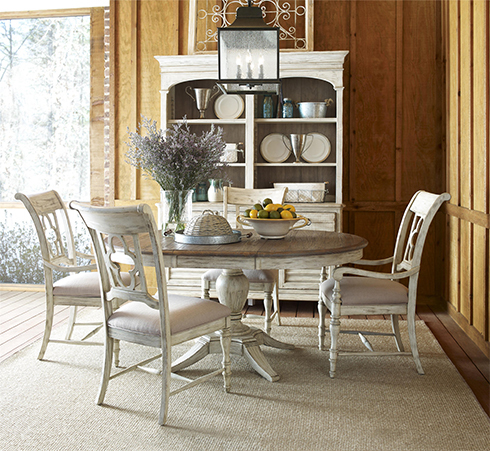 Weatherford's soft, weathered look is perfect for a casual or formal dining area. Choose between a round table that extends to an oval table or the rectangular table to fit additional guests. Dining chairs featured beautiful quatrefoil detail at the back. Alternate, fully upholstered back and seat chairs are also available. Mix and match the pieces to your liking, with your choice of finish options and combinations. Occasional tables, sofa tables, and consoles complete your living room or family room with a casual yet chic look. Available, again, in the variety of finish choices. These living room pieces easily coordinate with casual slipcover sofas or sophisticated tufted designs. It's obvious that every detail from this collection was carefully thought out and purposefully created. Footboard storage drawers provide additional storage, beautiful turned legs feature beautiful carving details, and silverware trays keep things safe and organized in the dining sideboard. For more Kincaid Collection and Weatherford Details visit Belfort Furniture's Campus of five showrooms filled with hundreds of room settings. Conveniently located in Dulles, Virginia, our knowledgeable staff are here to help guide you through your furniture selection process. Looking for a little extra help when it comes to decorating and designing your home's interior spaces? Take advantage of our Design Services and view our Interior Designers' Portfolio of past projects.